IN THE SERVICE OFSCHOLARSHIP: HAROLD HUGO & THE MERIDEN GRAVURE COMPANY (Oak Knoll Press 2017). 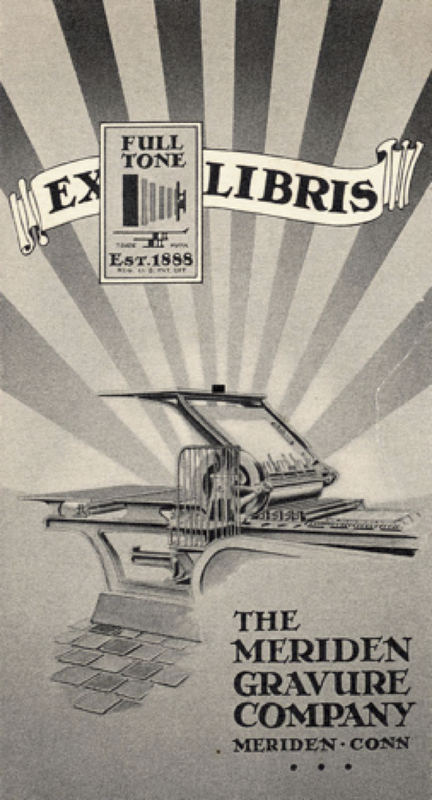 Mr. Glick, a member of the Meriden Historical Society, will present an illustrated talk about the Meriden Gravure Company and the talented people who were the driving force behind this world renowned, Meriden based, printing company. In his presentation Bill will draw on his 30-year association with the company as well as on his extensive research when writing his recently published book. Book signing will follow the discussion. A limited number of books (@ $75.00) will be available for sale for cash, checks or PayPal payments. Profits of the sale go to benefit the activities of the Meriden Historical Society. This program is free to both members and non-members of the Meriden Historical Society. Refreshments will be served. We no longer use cotton gloves when handling materials at the Society. All materials are now handled with acid free, disposable, highly tactile Nitrile gloves. This procedure protects both materials and handlers. 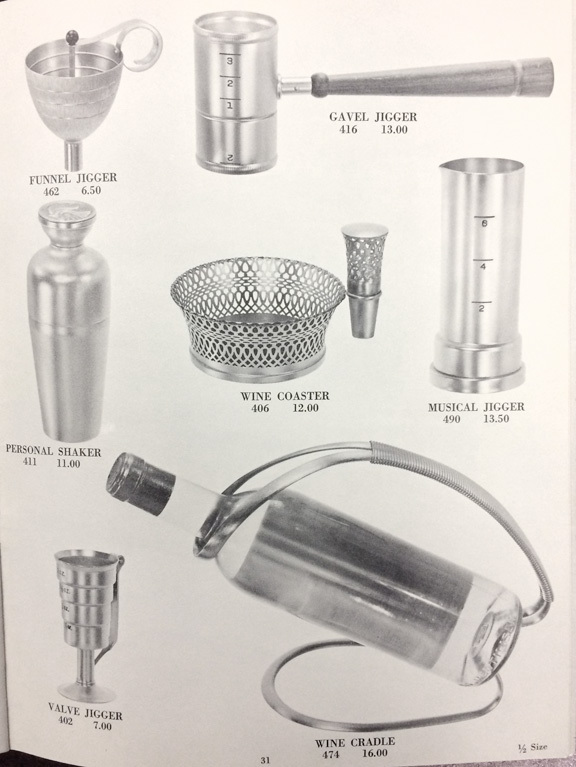 Napier created other objects as well, as seen in this page from Napier’s 1967 catalog JEWELRY AND GIFTS by Napier® – Napier is too good to hide. The society recently enjoyed a visit by Melinda L Lewis and her husband Mark. Melinda is the author (together with Henry Swen) of the encyclopedic book, The Napier Co. Defining 20th Century American Costume Jewelry. (Life By Design Publishing – 2013) The couple browsed through our Napier archives, reviewing information from material in the Society’s collection. It is said that a good product will sell itself but only if people know that it exists. It is apparent through the cataloging of the materials in the International Silver Company Archives at the Meriden Historical Society, that IS really knew how to get the word out, including enlisting the help of famous personalities! The Archives contain a wealth of information documenting the various methods used to do just that. Both IS and their retailers worked together to advertise the various product lines to their customers, following well planned out advertising campaigns developed at the headquarters in Meriden. Examples of the coming year’s advertising campaigns are included in the collection which outlines the advertisements that would be placed in various national magazines along with suggestions for local advertisements to be placed by the individual retailers. Contained within numerous ‘scrap books’ (arranged chronologically by month, year and line), are the actual advertisements placed in the national magazines including both trade journals and popular magazines such as: Brides Book, Harpers Bazaar, House Beautiful, House & Garden, Ladies’ Home Journal and the Saturday Evening Post. A number of volumes contain the local ads as well. But placing an advertisement alone won’t make the sale so IS created materials to help train the salesmen. One such publication was a newsletter called the International Silver Service, which they started in September of 1932. The newsletter was sent out to retailers and included articles on new products, special monthly promotions, announcements of upcoming radio and print advertising campaigns and helpful information on how to treat a customer so that they not only made the initial sale but were enticed to come back again and again. The April 1933 edition of International Silver Service announced that Mickey Mouse had been enlisted as their latest salesman. He would help make sales through the introduction of a number of items in silver plate for children including plates, cups, porringers and flatware decorated with his image. “Salesman Mickey Mouse Ready to Work for You” reads the title of one of the articles. 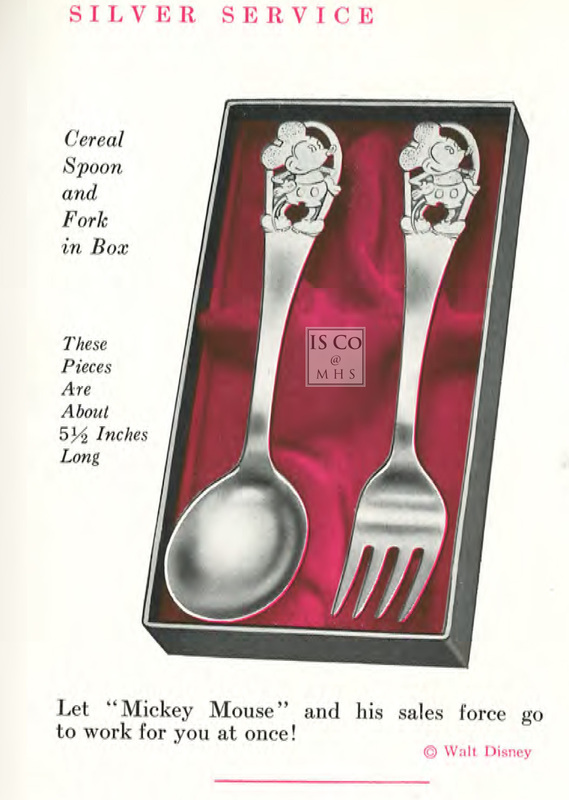 In September of 1933, the Mickey Mouse flatware (along with a cup and porringer) started being offered in sterling along with the addition of items featuring Minnie Mouse, Clarabell Cow and Horace Horsecollar flatware adding to the ‘sales force’. The article announcing the new offerings in sterling begins with “A successful salesman sells himself.” Clearly the message was not intended to just apply to Mickey Mouse but also the retail salesman reading the newsletter as well. It is no wonder that IS became the largest silver producer in the world. Stacey McConlogue for her donation in memory of Jean Lord Greenlaw, and to Gregg Hugo for his donation in Memory of his wife Bonnie. The Meriden Historical Society extends its condolences to Gregg Hugo on the passing of his wife Bonnie; to Charles Kline on the passing of his mother Eleanor and to Andrew Piatek on the passing of his mother Dorothy.